The company contacted me with an interesting idea for a collaboration video. They asked me to come up with a project and they would provide the PCB's. I have always wanted to build a Midi Fader box with some high quality - full size faders. So I created the FADR-8. I decided to use a Teensy LC microcontroller as the brains of the unit since it handles USB Midi very well. I also went with a three digit LED display for that retro vibe. Finally, I added two buttons that allow for setting the values of the faders and switching between eight banks of presets. To top it off, I made some custom 3D printed fader knobs. The project uses ALPS RS6011SP6003 faders and a Hammond 1590DDBK box for the enclosure. To drive the LED display I used a MAX7219 chip I had in stock and a 74AHCT125 level converter chip to make it play nicely with the 3.3v Teensy board. Working with faders is much more challenging that working with potentiometers. Instead of a simple drill hole, faders require a accurately cut slot in the enclosure. For this you will need a milling machine. I would hate to try this with hand tools. Overall this was a very satisfying project. The PCB's from JLCPCB were perfect and everything fit together nicely. Watch the video below to see how everything came together. Dave, hope you are well, this piece is very nice! As soon as you can let us know how we can rock one! 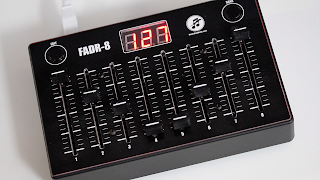 Hi, Can you tell me if and where I can buy a FADR 8 complete and ready to use. Good weblog; Just about all pianos can obtain all of the excellent details about customized pianos are nice often regarded as luxurious products. Be prepared to squander your money on a single of these pianos since they consider the additional time to build and might need special tools or even elements. Almost any type of violin can be created personalized through great in order to electric piano http://www.allpianos.com. The video is always easier to learn than text.